GitHub - AI-HELP/AIhelp-iOS-SDK: AIHelp IOS SDK. Want to be notified of new releases in AI-HELP/AIhelp-iOS-SDK? SDK supports iOS versions 8 and above. Click the button "Clone or download" in the top right corner to download iOS SDK and then unzip the file. Copy the ElvaChatServiceSDK folder to your main directory. Add -ObjC to Build Settings-Other Linker Flags. Add framework to Link Binary with Libraries: webkit.framework. Add framework to Link Binary with Libraries: libsqlite3.tbd. Add framework to Link Binary with Libraries: libc++.tbd. setUserName Set User In-App Name.If there is no uname,use string @"",The system uses the default nickname "anonymous"
In the application: didFinishLaunchingWithOptionsmethod of AppDelegate of the project, the SDK initialization method is invoked. appId A unique ID Assigned to your App. // Must be called during application/game initialization, otherwise you can't use AIHelp properly. //You need to add the same label to'AIHelp Web Console'before it takes effect. playerName In-App User Name.If there is no uname,use string @"",The system uses the default nickname "anonymous"
playerParseId Can be empty string, can NOT be NULL. showConversationFlag Should be "0" or "1". If set "1", the manual conversation entry will be displayed in the upper right hand side of the AI conversation interface. config Optional parameters for custom Dictionary information. You can pass specific Tag information using vector elva-tags, see the above coding example. Please note you also need to configure the same tag information in the Web console so that each conversation can be correctly tagged. Use this method to launch your APP's customer service. Configure specific welcome texts and AI story lines in the AIHelp Web Console to better the customer support experiences. Enable Manual Conversation Entry to allow users' to chat with your human support team with the parameter "showConversationFlag" setting to "1", you may use this method for any user or as a privilege for some users only. config Custom Dictionary information. You can pass specific Tag information using vector elva-tags, see the above coding example. Please note that you also need to configure the same tag information in the Web console to make each conversation be correctly tagged. Normally you don not need to use this method unless you intend to allow users to enter manual conversations without engaging with the AI chat. You may use this method as a privilege for some users. The operation module is useful when you want to present updates, news, articles or any background information about your APP/Game to users. playerName User Name in Game/APP.If there is no uname,use string @"",The system uses the default nickname "anonymous"
showConversationFlag Should be "0" or "1". If set at "1", the manual conversation entry will be shown in the top right-hand corner of the AI conversation interface. config Custom Dictionary information. You can pass specific Tag information using vector elva-tags, see the above coding example. Please note that you also need to configure the same tag information in the Web console so that each conversation can be correctly tagged. defaultTabIndex Optional. The index of the first tab will to be shown when entering the operation interface. Default value is 0, default value of is the left-most tab, if you would like to show the AI conversation interface(the right-most) should be set to 999. Use this API to present news, announcements, articles or any useful information to users/players. Configure and publish the information in AIHelp web console. config Custom Dictionary information. You can pass specific Tag information using vector elva-tags, see above coding example. Please note that you also need to configure the same tag information in the Web console to make each conversation be correctly tagged. Use this method to show FAQs about your APP/Game properly. Configure FAQs in AIHelp Web Console. Each FAQ can be categroized into a section. If the FAQs are great in number, you can also add Parent Sections to categorize sections to make things clear and organized. sectionPublishId The PublishID of the FAQ item, you can check it at AIHelp Web Console: Find the FAQ in the FAQ menu and copy its PublishID. faqId Number of FAQ. Open AIHelp Background and find the FAQ number of the specified FAQ under the Robot Frequent Questions page. Note that this FAQID cannot fill in the FAQ number that does not exist in the customer service backstage. Use this method when you want to show a specific FAQ in a proper location of your APP/Game. Use this method after the SDK initialization.The App's name will be displayed in the title bar of the customer service interface. Normally you don not need to use this method if you have passed the user ID in another method. playerName User/Player Name.If there is no uname,use string @"",The system uses the default nickname "anonymous"
Use this method to set the user name, which will be shown in the web console's conversation page for the user. You can address the user with this name during the chat. Normally you don't need to use this method if you have passed user name in other method. Normally you don not need to use this method if you have passed the server ID in another method. 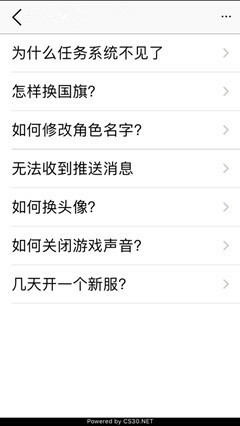 Setting the SDK Language will change the FAQs, Operational information, AI Chat and SDK display language. language Standard Language Alias. For example: en is for English, zh_CN is for Simplified Chinese. More language labels can be viewed at AIHelp Web Console:"Settings"-->"Language"->Alias. Normally AIHelp will use the mobile's language configuration by default. If you intend to make a different language setting, you need to use this method right after the SDK initialization. If your allow users to change the APP language, then you need to use this method to make AIHelp the same lanague as your APP. If there are multiple windows and the interface such as showElva is called directly, the interface is called when the page cannot pop up. Set a Different Greeting Story Line. // note：anotherWelcomeText is key, should be unchanged. Introduce different story lines to users from different sources.